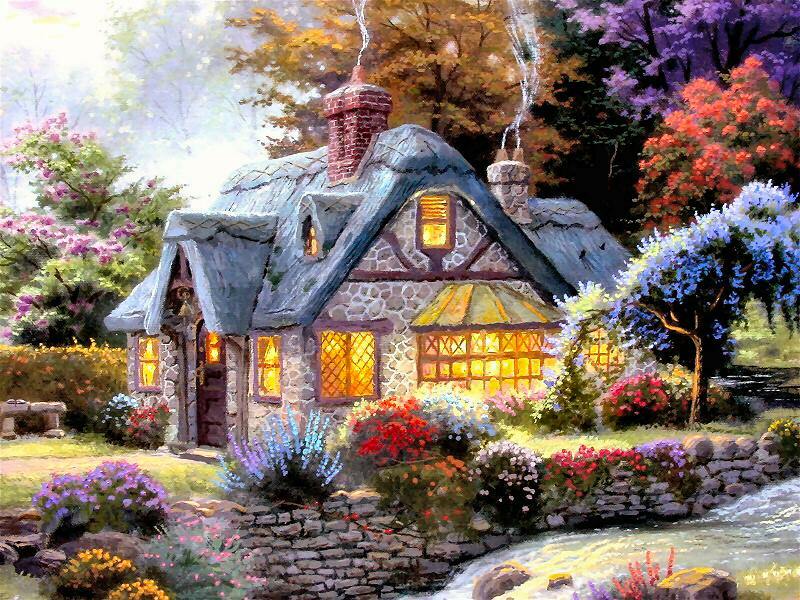 Thomas Kinkade paintings featuring glowing cottages are among his most popular collectables. 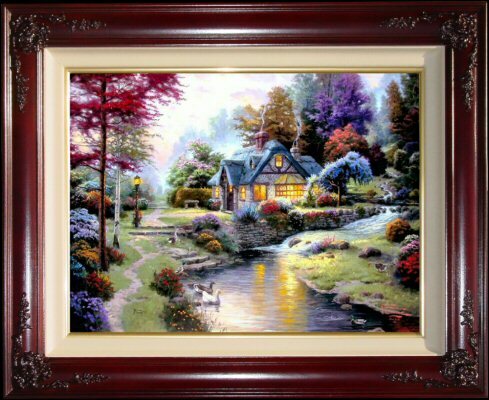 Stillwater Cottage is the first painting in Thomas Kinkade's new Peaceful Cottages series. ++++ Brass Plaque with the legend "Stillwater Cottage ~~ Thomas Kinkade"
Examination Proof (E/P) Canvas An Examination Proof (E/P) edition was created and so named to give collectors a chance to examine new images and place orders pre-publication. It is the "show off" edition of the artwork. Examination Proofs are issued in Canvas only with hand embellished oil highlighting and in only one size. 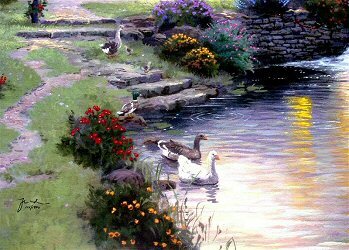 "Still waters run deep; the waters of this crystal pool offer balm to the soul. Here, in this tranquil glade, God's perfect peace reigns. I have frequently tried to capture on canvas such refuges. Stillwater Cottage, which introduces my new Peaceful Cottages series, is, in a sense, the companion piece to a painting I did years ago entitled Beside Still Waters. This cottage sits comfortably in its hushed setting, where no breeze rustles the leaves of the trees and the only motion is provided by the graceful gliding geese. 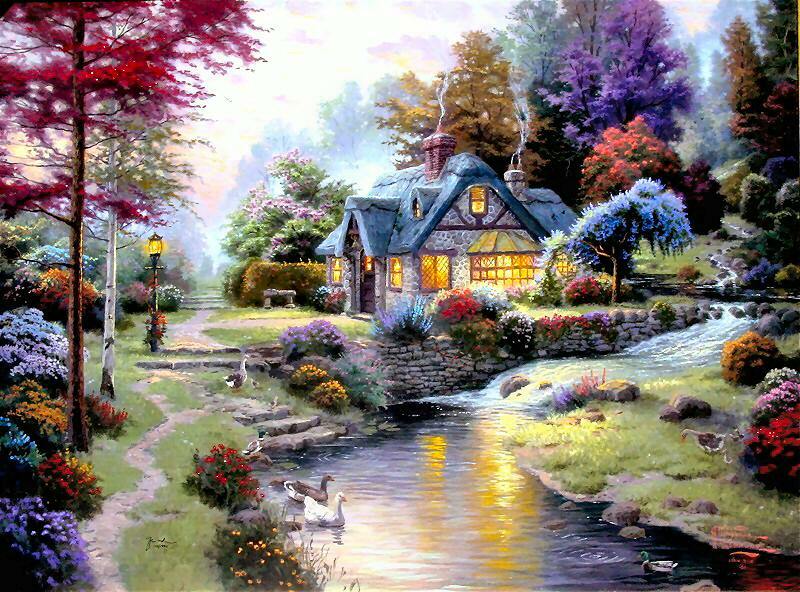 I wanted Stillwater Cottage to come alive for you as a place of refuge. The light pouring from the windows suggests that a family dwells at peace within. Carefully observed details - the weathered brass bell over the door, the stone bench and ancient rock retaining wall - give this cottage character. The rich colors of sunset bathe the glade and the distant trees in glorious light. In this place, God is surely present; we feel the comfort and protection we can only know when we are in His hands."